Take an ice tray, add pomegranate seeds in each compartment, water and let it set in the freezer to make pomegranate ice cubes. Take a bowl. Add orange syrup, 2 glasses of cold water, chat masala, black salt, honey and mix it well. Take 3 glasses. 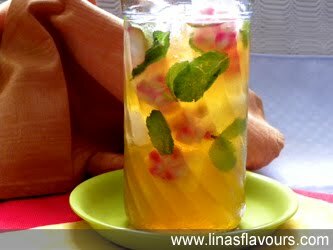 Add ice cubes, pomegranate ice cubes, mint leaves and pour orange juice. Note: To make it more interesting you can even add chat masala while making ice cubes. Instead of orange syrup you can use orange juice also.